Within the past few years, technology has experienced massive innovations and growth. Particularly, internet has gained prominence all over the world and is currently being used for almost everything, for example, online shopping, online banking, online bill payment, etc.. The term, Social media, means interactive platforms that can be used by communities and individuals to share content that is user-generated. This can be in various forms, for example, magazines, internet forums, social blogs, etc. However, the most common today are the various internet forums or websites. The China social media leads the way of all other social media of the world. A majority of the Chinese people use internet in China on a daily basis. According to a survey conducted in April 2012, 95% of the internet users visit a China social media website at least once every six months, in contrast to 30% in Japan, 70% in South Korea and 67% in the US. Apart from sharing photos or messaging via various China social networking sites, the social media in China has a greater impact on the purchase decisions of the consumers in China, in contrast to other individuals anywhere around the world. The people in China claim that they prefer purchasing those products that are marketed on the various China social media websites or those that are mentioned or recommended by their friends over the same social media websites. 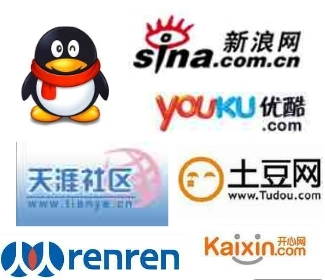 Amongst the various social networking websites that are being used in China, the top five are; Sina Weibo, Renren, Tencent, Douban and Wechat. Sina Weibo is just like Twitter; however, it has comparatively a lot more users in China. Over 22% of the Chinese population that uses internet consider Sina Weibo to be an important platform. This popularity can be linked to its features, by which users can include videos or images. Moreover, Chinese celebrities also rely on Weibo to connect to their fans. Similarly, Renren is the substitute for Facebook. This website caters to the college-educated Chinese population, with around 147 million users that are registered, amongst which 31 million are active each month. Tencent, on the other hand, is more like a hub of social media with instant messaging facilities. To be able to use all the different services offered by Tencient, you need to have a QQ account. In contrast, Douban is an open forum that can be used to discuess book, movie and music reviews. It has registered users amounting to 60 million, while 80 million users are active per month. This means that Douban even allows unregistered users to have access to around 80% of the web content. Lastly, Wechat is a mobile application that has many social features, for example, friend discovery. Though it was not meant to be a typical social networking website, many of the similar features have been added to the product. Currently, there are over a hundred million users of Wechat. The level of article enjoys buy real instagram followers, page loves and reactions you will end up generating are very important on Experience guideline. Therefore it is actually useful in case you have a little bit assist ways to get began. You can get this support by using acquired followers, publish and loves from us and set up oneself besides the degrees of rivalry.